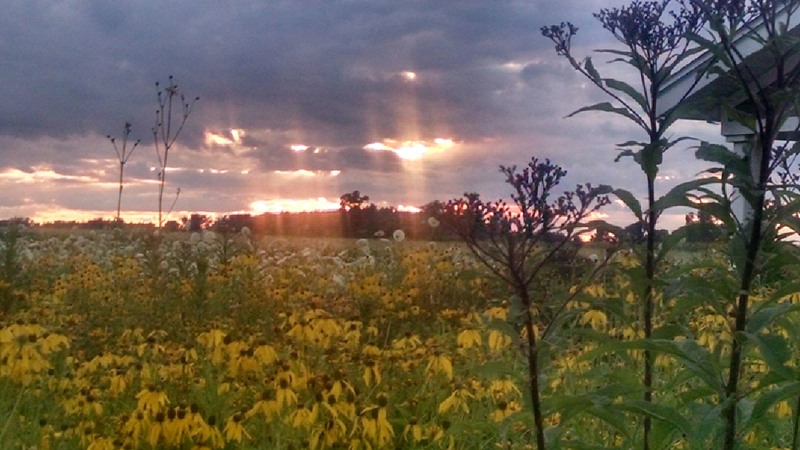 It took some vision to see a native prairie when Eric Peterson first purchased his home in 2011 in rural Berkey, Ohio. 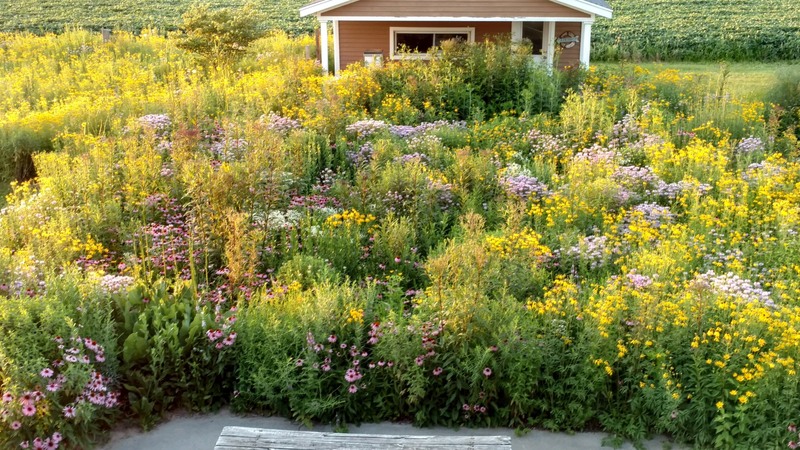 There was an old farm house surrounded by agricultural property, five huge maple and three huge fir trees, an old barn foundation with a stone driveway, an unused inground swimming pool, and a yard that was half-mowed for curb appeal leaving the rest to grow wild with every common non-native weed imaginable. Bringing the property to life took time and commitment, but once Peterson buried the barn foundation and filled in the pool, the ground was a blank slate. 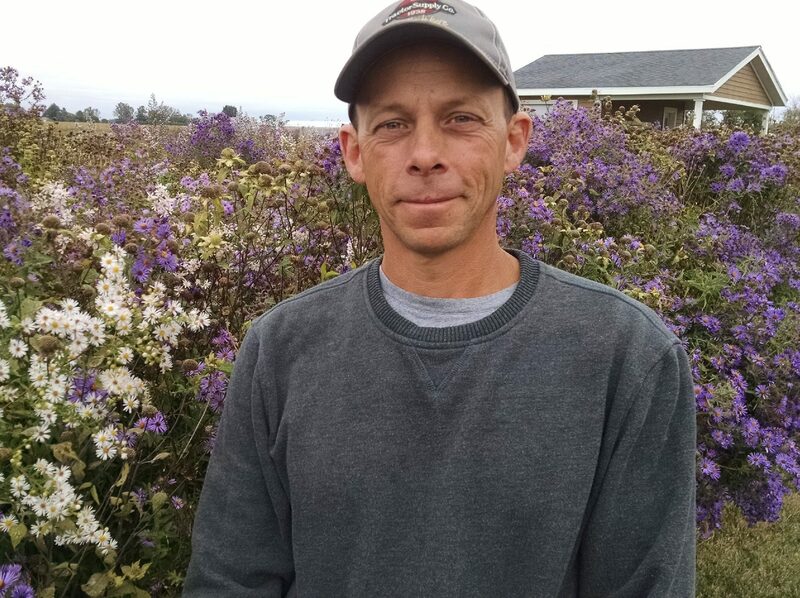 Peterson had been volunteering at Seven Eagles Educational Foundation (Wood County, Ohio) where he was inspired to plant a native prairie on his own 1.2 acres using natural seeds rather than buying plants. Peterson started with just a 30 ft x 50 ft section of his “yard.” He used herbicide to kill everything. At this time, he has about 15,000 square feet converted to natives, which is about one third of his total property. This year, he plans to expand by continuing the natives in his front yard, so passers-by can get a better view. Peterson hasn’t regularly use controlled burns on his property because it’s surrounded by agricultural lands and windy. Each year, he takes a metal-bladed weed whacker and “mows” everything. This knocks down the dead growth and lets the growing natives come up. He says it takes him about eight hours to do the whole plot. If he was mowing the property rather than taking care of the native space, Peterson estimates that he’d spend at least one hour a week during growing season mowing. He’d also spend more money on gas and equipment maintenance. Most of Peterson’s seeds have been collected from various local sources and most were free. It’s important to use local seeds for Oak Openings Region restoration projects to protect the integrity of the local genome. 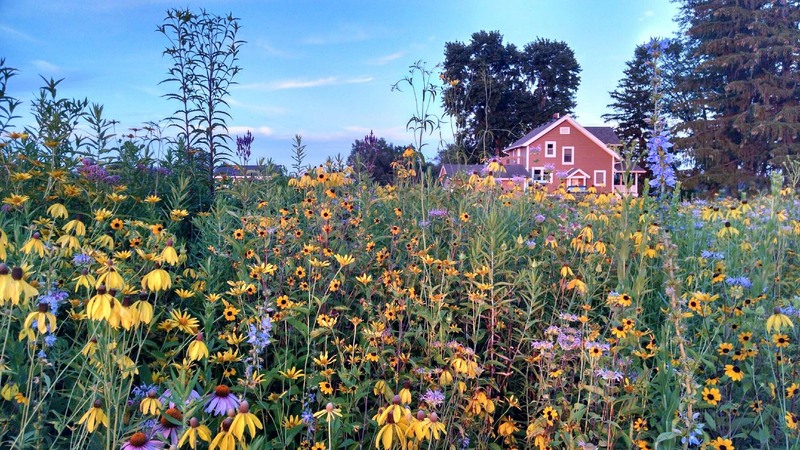 The Oak Openings Green Ribbon Initiative (GRI) can help landowners find seeds to get started. Over time, the natives will generate their own seeds that can be harvested and planted to expand the native area. It can take up to two years for some natives to become established and Peterson admits he’s learned some tricks over the years to help this happen faster. Some tried and true methods to keep seeds in place? If you’re converting an area covered with turf grass, you can kill the grass with herbicide, let it rest for a week or so and then spread the seed on the dead grass. According to Peterson, this helps prevent erosion of the seeds. Sometimes trees germinate from seed that blows onto Peterson’s property. 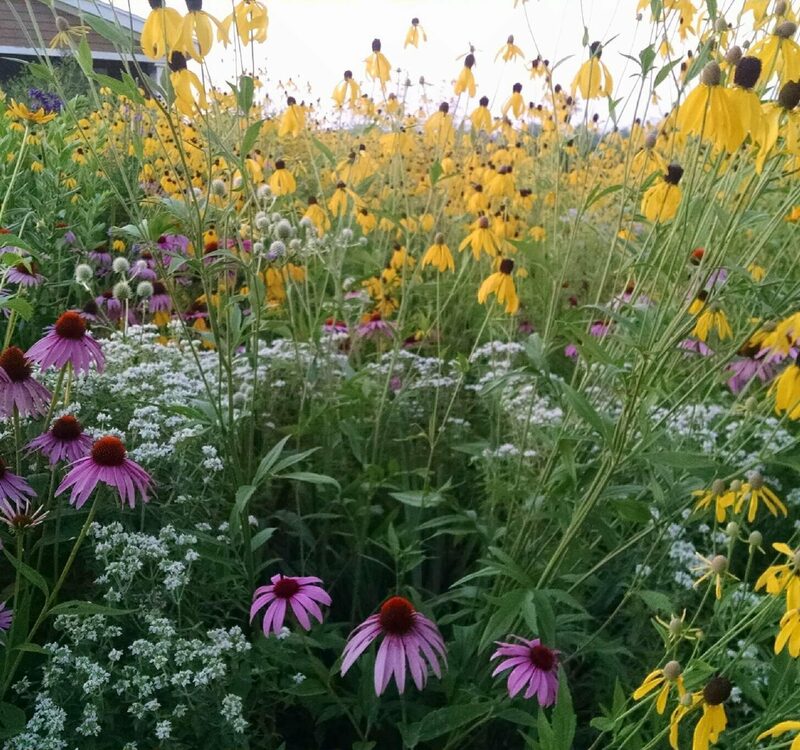 Since he’s created his native prairie, he’s been surprised by how hard it’s become for the non-natives to grow. He’s used herbicide for those that have tried. 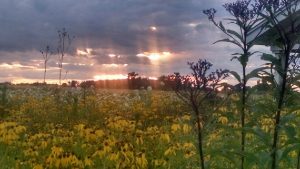 Peterson has over 80 species of flowers and 15 types of sedges and grasses growing in his native prairie including Michigan lilies, asters, bergamot, gray-headed coneflower and dotted horsemint. He specifically plants a mix of common forbs with some sedges to attract pollinators and birds, who regularly feed or nest on his property. He keeps tallgrass species to a minimum because they are very aggressive and can compromise the other natives. 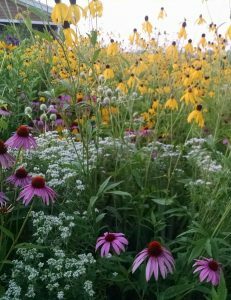 Costs to create and maintain his native prairie are minimal because the seed is free and the herbicides he uses are widely available. Peterson also collects and gives away many of his seeds and enjoys seeing them grow on other places across the region. His next project is to plant the east side of his property. Whether you choose to undertake a garden project like Peterson or simply want to become more aware of what’s in your own backyard, there are many free local resources that can help. Contact GRI to connect with someone who can give you free seeds or advice. In addition, if you live in the Oak Openings Region, you can register your property with the Oak Openings Green Ribbon Initiative Landowner Registry.